Analysis: Tonyan will remain in Green Bay after recording four receptions for 77 yards and a touchdown in 16 games last season. He began the season primarily as a special team's contributor but carved out a role on offense as time went on. Look for him to be a depth option behind Jimmy Graham and Marcedes Lewis. Analysis: With less than three accrued seasons, Tonyan is an exclusive rights free agent, leaving him with no option but to sign the aforementioned tender. He was active for all 16 games last season, first as a special teamer before slowly but surely working his way into the offense. With fellow tight ends Lance Kendricks and Marcedes Lewis about to become unrestricted free agents, Tonyan will enter the new league year as the No. 2 to starter Jimmy Graham. Tonyan caught one pass for seven yards in the Packers' Week 17 loss to the Lions. Analysis: Tonyan suited up for all 16 games in 2018 and finished with four receptions for 77 yards and a touchdown, the bulk of which game on a 54-yard score Week 11. The Packers clearly saw something they liked in order to activate him for every game, but he remains more project than prospect, and it remains to be seen if the next coaching staff in Green Bay views him the same way. Tonyan caught one pass for 11 yards in Sunday's victory over the Jets. Analysis: Tonyan played a season-high 15 snaps in Sunday's overtime victory, which was just 16.5 percent of the 91 plays the Packers ran, but also a 2018 high for the second-year tight end. 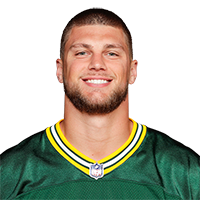 He has played at least 10 percent of the snaps in four straight games after playing just 14 snaps all season prior to that, and chances are good he sets another season high Week 17 with the Packers playing out the string. Tonyan played eight snaps on offense in Sunday's loss to the Bears and was not targeted. Analysis: Tonyan has not gotten any more involved in the Packers offense since catching a 54-yard touchdown against the Seahawks in Week 11. With the Packers now eliminated from playoff contention, the team could decide to give Tonyan a longer look, but unless the Packers explicitly announce that at some point this week, that purely will be speculation. Tonyan played seven snaps and was not targeted in Sunday's victory over the Cardinals. Analysis: The seven snaps were the second most Tonyan has played in a game this season, but that total was still fourth among Packers tight ends in Week 14, and not enough to make any sort of fantasy impact. Tonyan caught one pass for five yards in Sunday's loss to the Cardinals. Analysis: Tonyan's reception was his second of the season, and first since he hauled in a 54-yard touchdown against the Seahawks in Week 11. His total output all but keeps him off the fantasy radar for now, but it should be noted he played a season-high nine snaps on offense Sunday, and he could see even more opportunities at some point should the Packers, only on the fringes of playoff contention, elect to take a longer look at some of their younger players. Tonyan played one offensive snap in Sunday's 24-17 loss to the Vikings and wasn't targeted. Analysis: Tonyan had a tiny bit of fantasy intrigue in Week 12 thanks to a long touchdown grab in the team's previous game against the Seahawks. The fact that fellow tight end Jimmy Graham (thumb) was limited Sunday was also expected to help Tonyan, but the 24-year-old ultimately didn't factor into the offense in any noticeable way. Tonyan brought in his sole target for a 54-yard touchdown in the Packers' 27-24 loss to the Seahawks on Thursday. Analysis: The 24-year-old tight end ensured his first career catch was a memorable one, as he made a scoring grab late in the first quarter on a play where Aaron Rodgers bought plenty of extra time with his scrambling ability. While he's been stuck at the bottom of the depth chart all season, Tonyan could bump up a notch if the thumb injury that forced Jimmy Graham from Thursday's contest turns out to be serious enough to cause a multi-game absence. 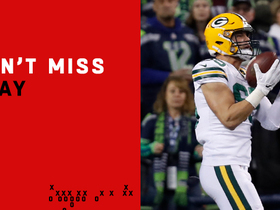 Check out the Next Gen Stats from Green Bay Packers QB Aaron Rodgers' improbable throw to tight end Robert Tonyan. Green Bay Packers quarterback Aaron Rodgers launches 54-yard touchdown pass to tight end Robert Tonyan.